Hey hey! 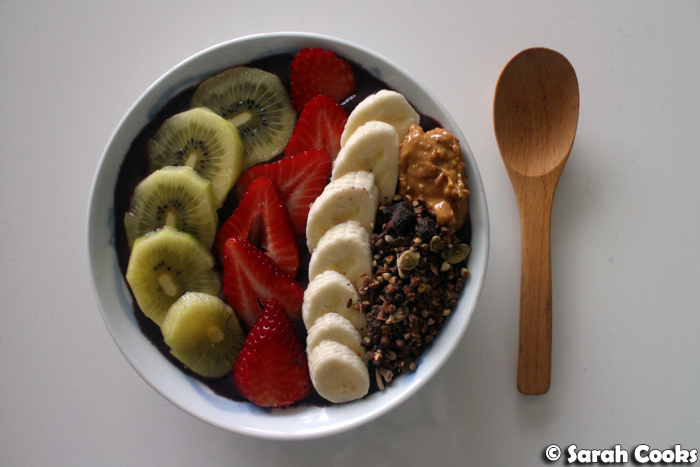 Açaí bowl time! 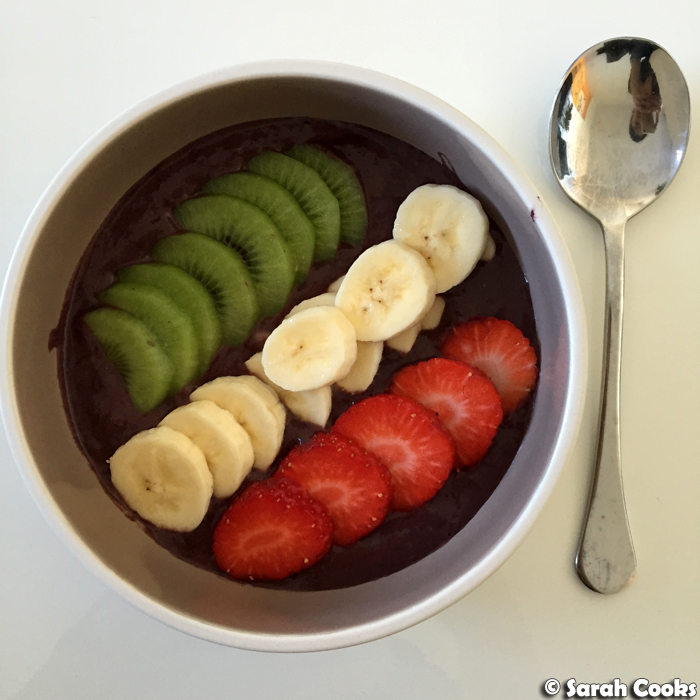 If you follow me on Instagram, you might have noticed I'm super obsessed with Açaí bowls right now! Açaí bowls are all over the trendy health-focussed cafes, but it was only a month ago that I tried one for the first time, at Legacy Cafe in Camberwell (blogpost to come!) 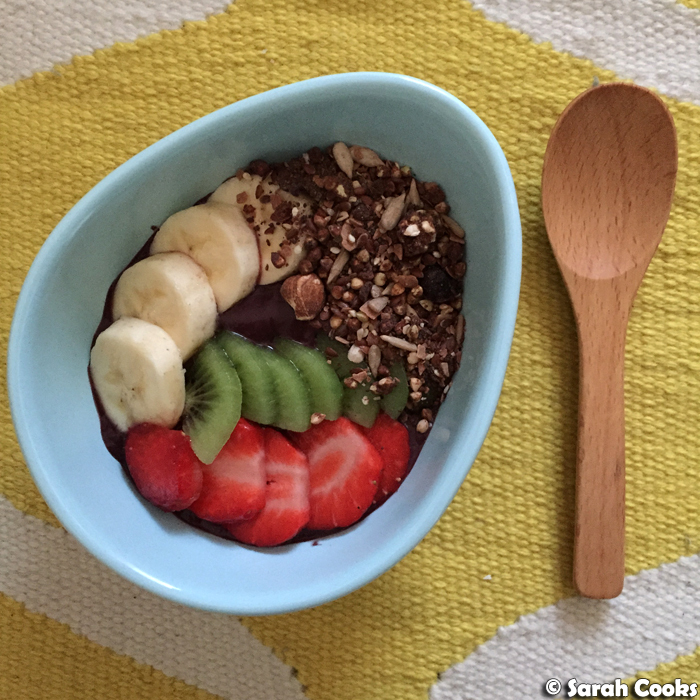 I loved it, then promptly went out and bought some açaí purée and started making my own açaí bowls. Now I have one for breakfast two to three times a week. Hooray! 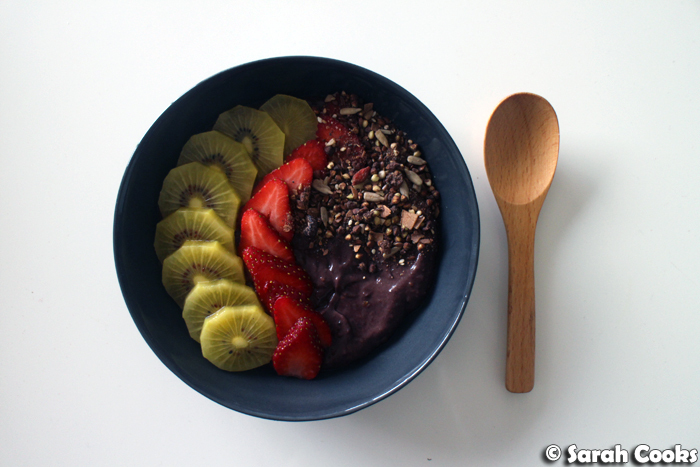 So, açaí is a Brazilian berry that grows in the Amazon and is supposed to be incredibly high in antioxidants, omega fatty acids and other goodness. Before Melbourne hipsters re-appropriated it, açaí na tigela ("açaí in the bowl") was (and remains!) a popular breakfast throughout Brazil, beloved for its refreshing taste and nutritional properties. I haven't developed a Brazilian booty yet, but I remain optimistic. 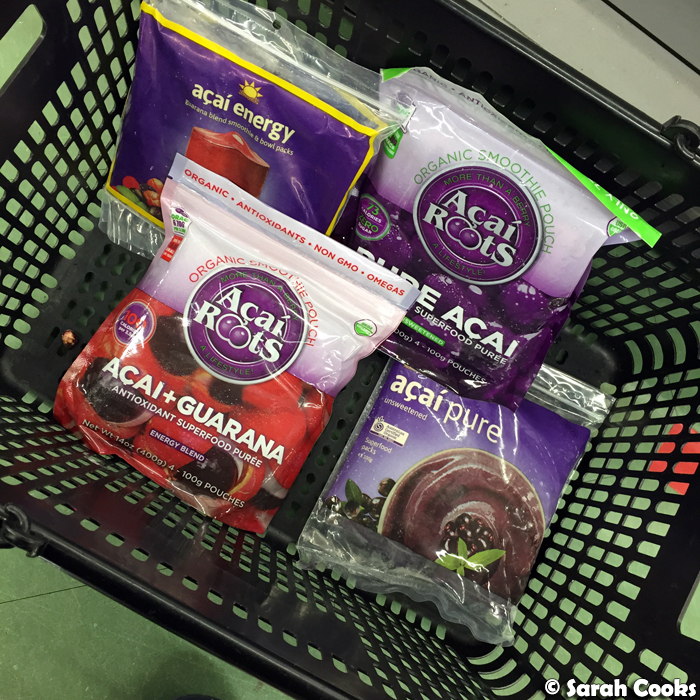 You can buy frozen açaí purée in little individual packets, ready to be turned into smoothies or breakfast bowls. I found mine at Leo's Supermarket in Kew, but I think they're available at different gourmet supermarkets and delis. I go for the plain açaí, unsweetened and without guarana, because I like to control the amount of sweetness and caffeine I have! Ok, to go from frozen açaí purée to açaí bowl, you defrost the purée in the packet under running water, then whizz it up with some fruit, liquid and sweeteners in a blender. After much experimentation, I've come up with my perfect ratio - one packet purée, half a banana, two to three pitted dates, and a couple of tablespoons of almond milk. (Or regular milk!) You can use honey for sweetness too, but I prefer the taste and texture of dates. 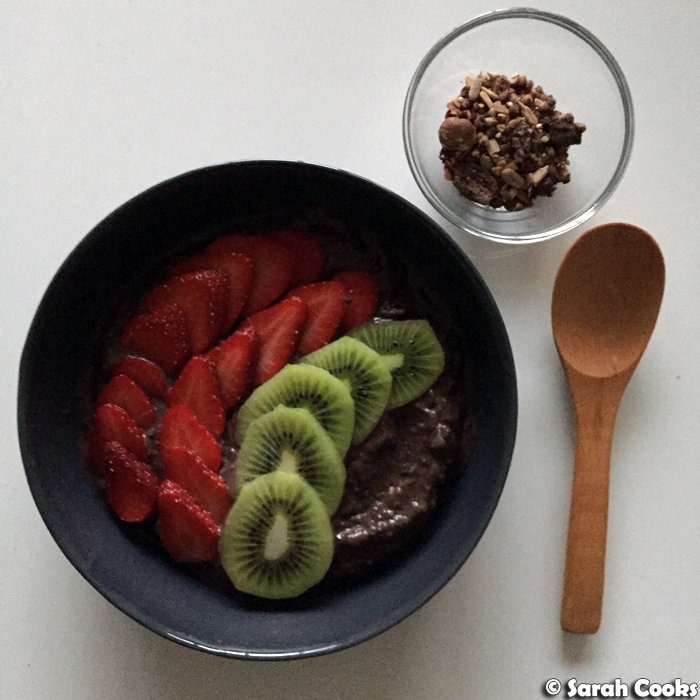 Sometimes I add a tablespoon of peanut butter or cacao to the purée, depending on my mood. One more thing to note - the amount of liquid you need will depend on your blender (my new NutriBullet needs more liquid than my old KitchenAid blender did), and the, um, moistness of your ingredients. As an example, if I use a fresh banana in the mixture, I usually don't need much extra liquid, but if I use a frozen banana, then I need a little extra liquid to bring everything together. Here's what the mixture looks like when I make it. 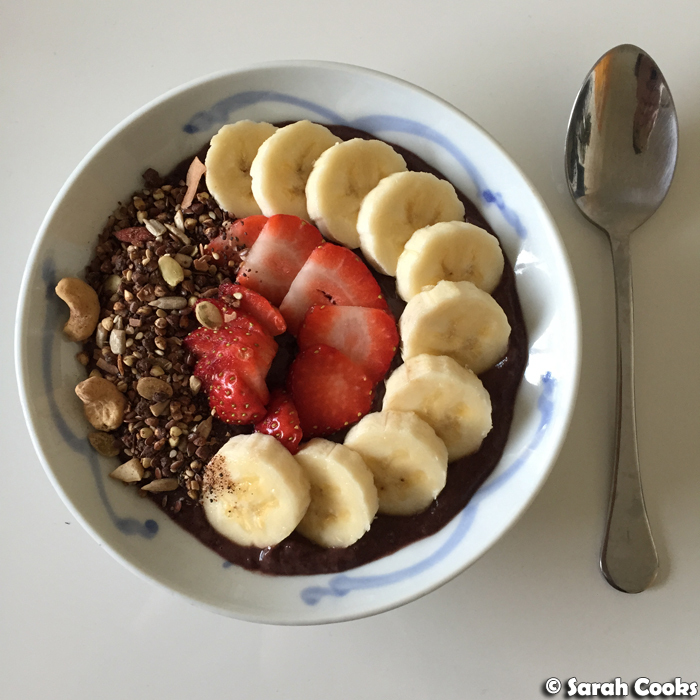 The açaí bowls I see around town seem to be lighter in colour (a higher ratio of other ingredients to açaí, probably), but I like having the açaí be the star ingredient of my breakfast bowl, and my recipe below makes the perfect-sized breakfast for me. Any more extra ingredients and I'd be stuffed! I love the intense deep purple colour too. The mixture is icy and creamy, like a sorbet. A refreshing, nutrient-packed sorbet! I know it's the middle of winter, but I can't stop eating them! Now, in terms of flavour... 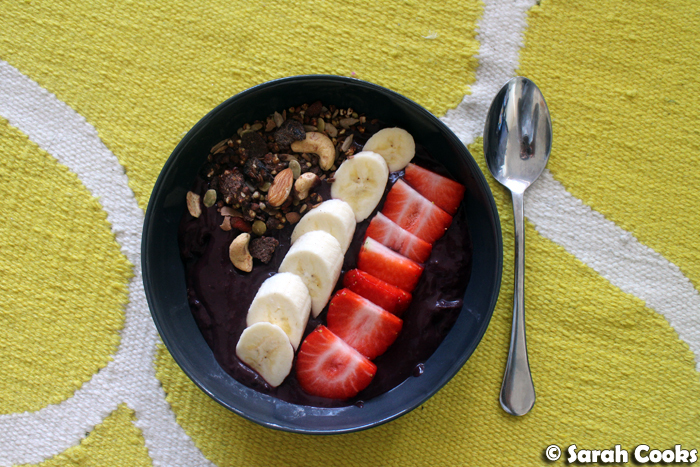 I find açaí quite earthy and a little tart. It's quite tannic too, with that slightly sticky feeling on your tongue that you get from tea or red wine. I think of açaí like a super-concentrated version of blueberry skins. I think some brands differ - I find the Amazonia brand to be earthier (blends well with cacao, peanut butter), and the Açaí Roots brand to be more berry-like (better with fruits and other berries). 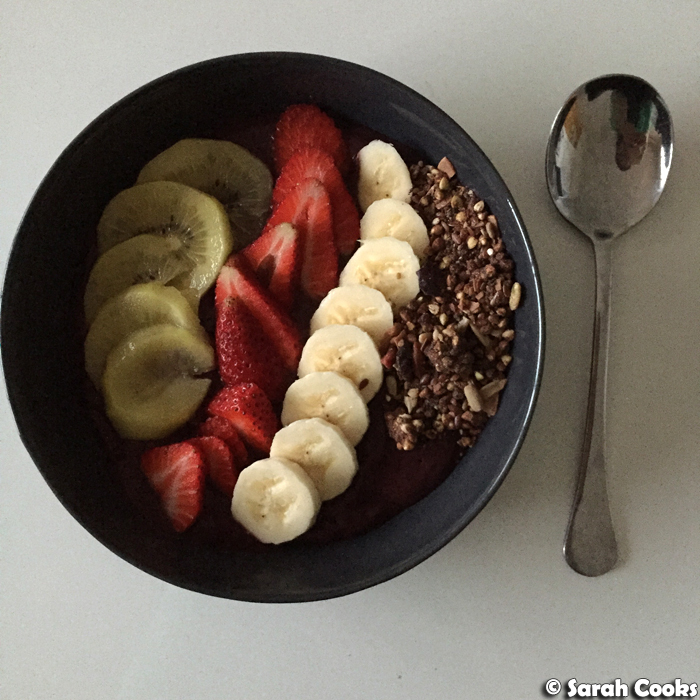 From here, all you need to do is top it with sliced fruit, granola, whatever you like! Do you açaí? 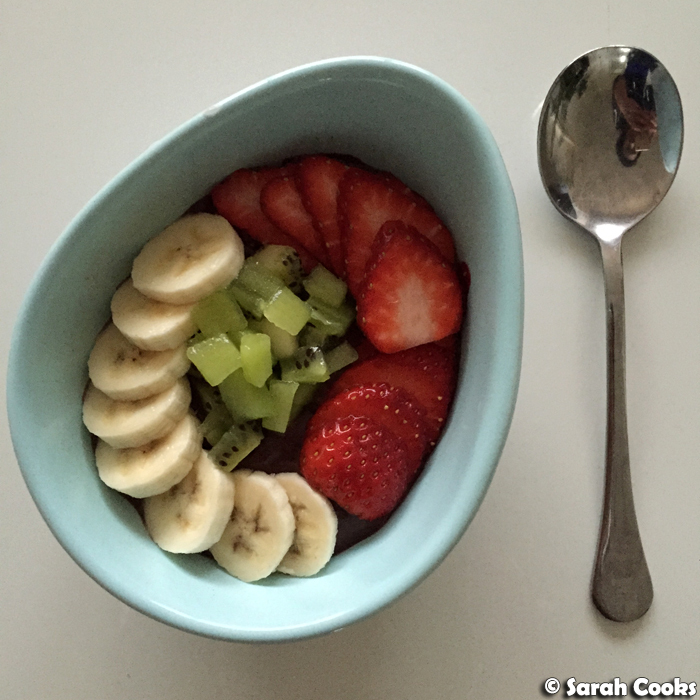 Smoothie or bowl? Do you have a favourite recipe or any serving suggestions? Please share your ideas with me! Defrost the açaí purée under the tap and break it up a little. Cut open the packet and put the açaí in a blender. 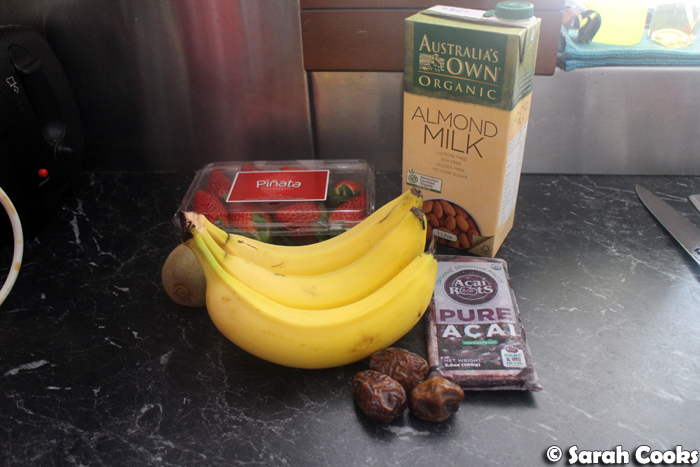 Add the banana, dates and almond milk, plus any of your optional ingredients. Blend until smooth, adding extra almond milk if necessary to make a smooth mixture. Taste and add extra honey for sweetness if you like. Scrape the mixture into a shallow bowl, and top with fruits and granola of your choice. 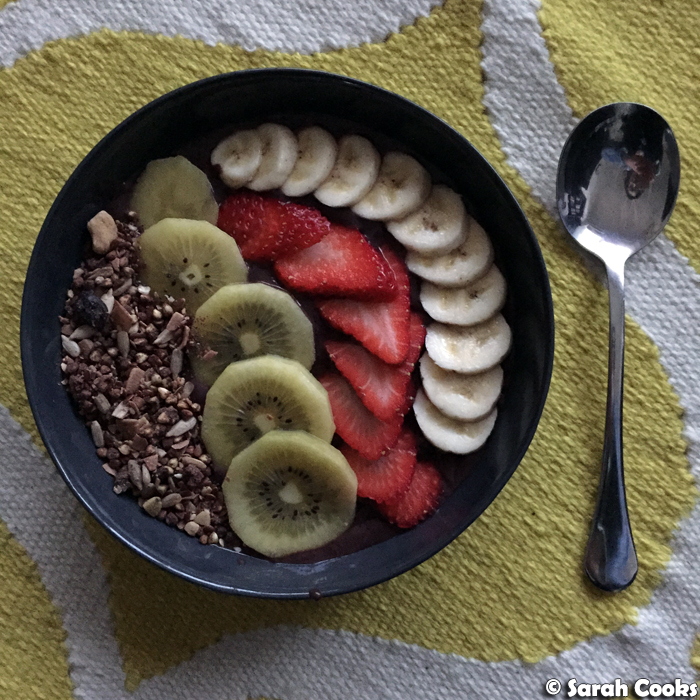 Love the look of your acai bowls, so fresh and dazzling! I've seen the puree in food stores but am yet to try it. 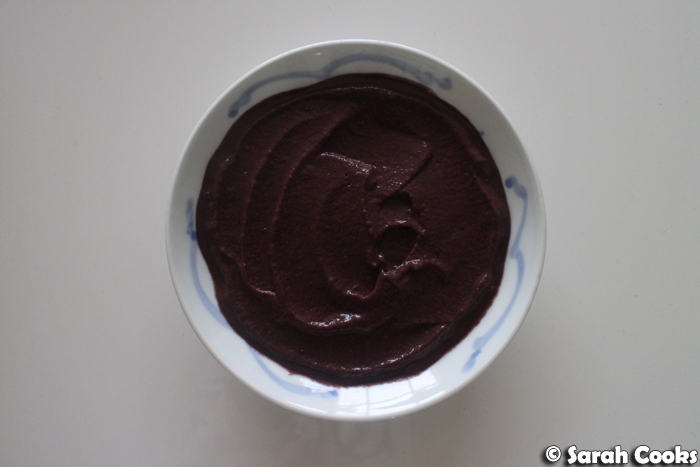 Oooooh, I have never used acai puree before. But these bowls look delicious. And I love the idea of it being like a sorbet! I will have to look out for this! I am totally intrigued and excited by the idea.